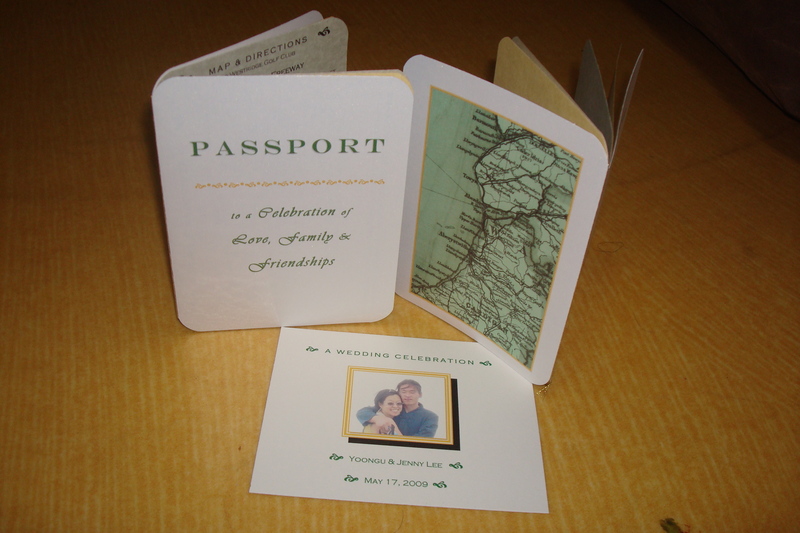 Passports are the perfect format for a travel-themed wedding! It also gives you a lot of leeway: you don’t have to worry about traditional formalities, such has having to spell out “five o’clock in the afternoon,” or enclosing everything in an “inner envelope” and including a separate reply envelope. Also, as many of you know, wedding invitations often end up being an unusual size which generally calls for special handling/extra postage from the Post Office. 1. I worked “backwards” in a sense. Rather than create an invite first and then go through the agony of finding a matching envelope to fit, I bought the envelopes first so it would literally set the boundaries of my invites. Staples sold a box of “invitation envelopes” that fit the bill: 4-3/8″ x 5-3/4″ which is basically an 8-1/2″ x 11″ piece of paper folded in quarters–easy! 2. Papers! I got parchment paper in “celery” and “gold” for the inside pages and a pack of white metallic paper which I LOVE for the cover! The metallic paper is made by Wausau, and it is metallic on BOTH sides, and guaranteed to print on inkjet and laser printers. 3. Binding: I bought gold metallic embroidery thread and hand-tied the passport pages together. 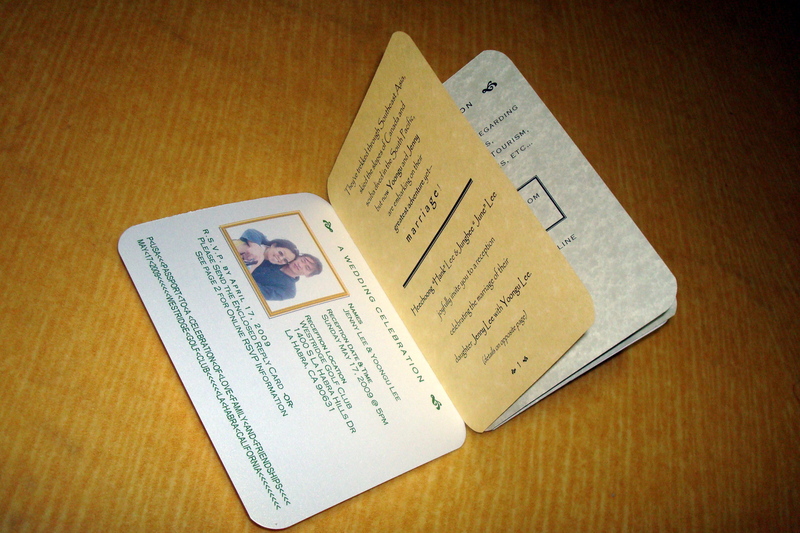 To keep the pages from slipping, and to make it look more like a real passport, I first cut all the corners with a rounded-corner punch. I think postcards work perfectly with our travel theme, plus I didn’t have to deal with a separate envelope. I printed these on bristol vellum paper for thickness. The back cover of the passport is large decorative map stamp that I recolored green through Paint Shop Pro (our wedding colors were yellow and green). The inner pages included information to our wedding website, a map and directions to the wedding venue, and a page with information about our traditional Korean wedding and traditional Korean wedding customs. End result: a Passport booklet that I just loved to pieces! Very nice! I also had a travel themed wedding reception and made a passport for our guest book. Would love if you came by to check it out. ~M. Love it! I hope to be able to make my own DIY wedding cards too. Thanks for sharing yours!